Women's eyeglasses fashions evolve every year, and the prices and choices we offer make it affordable to have more than one pair of frames. Although women's eyeglasses tend to have softer lines and more feminine colors than men's eyewear, most frames are unisex and can be worn by either women or men. With a range of prices, frame shapes, and materials along with a variety of color combinations for both eyewear frames and lenses, Eyeglasses.com makes it easy to buy multiple ladies eyeglasses to suit different occasions such as work, school, or leisure. Depending upon the frame, our female customers find that they can often order two pairs of women’s prescription eyeglasses at far less cost than they would pay for one pair of women’s spectacles at a regular retail eyeglass store. There is no reason today why women's prescription eyeglasses styles not only can be trendy, but also sophisticated. If you are looking for a retro or modern, bold or conservative, trendy or classic look, Eyeglasses.com has your style. Women nowadays are looking for shapes and colors that either complement or contradict their features. A “complementary” frame fits in well with the facial structure, as well as the coloring of hair, skin, eyes, and wardrobe. A “contradictory” strategy is one in which the eyeglasses are designed to stand out, to exude confidence, creativity, and to project individuality. There is no right or wrong strategy, and many women have several eyeglasses frames so that they have choice when arranging the daily assemblage. We offer over 400 top design brand names of eyeglasses frames. Almost every major designer has created their own collection, and in most cases, their eyewear collection coincides with the design goals and philosophy of the brand. For example, Vera Bradley which is well-known in handbags and bright colors has a very different approach to its eyewear collection compared to Versace. This biggest choice we see now in designer eyeglasses for women is the choice of logo or no logo. The trend is definitely towards non-logo designs; but that is not to say that Versace is not still one of the most important brands in the eyewear market. One of the up and coming brands is Tom Ford Eyeglasses, designed by the man of the same name who built the new Yves St. Laurent. Tom Ford eyeglass frames for women are simply beautiful, and they do not need a logo on the temple arms to prove it. Designer eyeglasses frames help women to find expression for their face in something that is totally unique. There are so many different styles of designer frames that women never need fear to run into someone wearing the same thing. 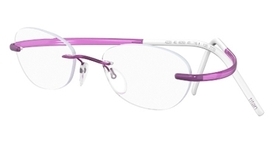 Plastic frames (actually zyl, which is a very high grade of plastic specifically designed for eyewear) are an open palette for frame designers which allows them to combine thousands of colors into exciting and unique patterns. Whether the frame is a solid plastic that has infinite variations, or layers of plastic in different colors, the plastic frame is like painting with oil on a canvas.